If The U.S. Government Read Personal Finance BlogsEliminate The Muda! 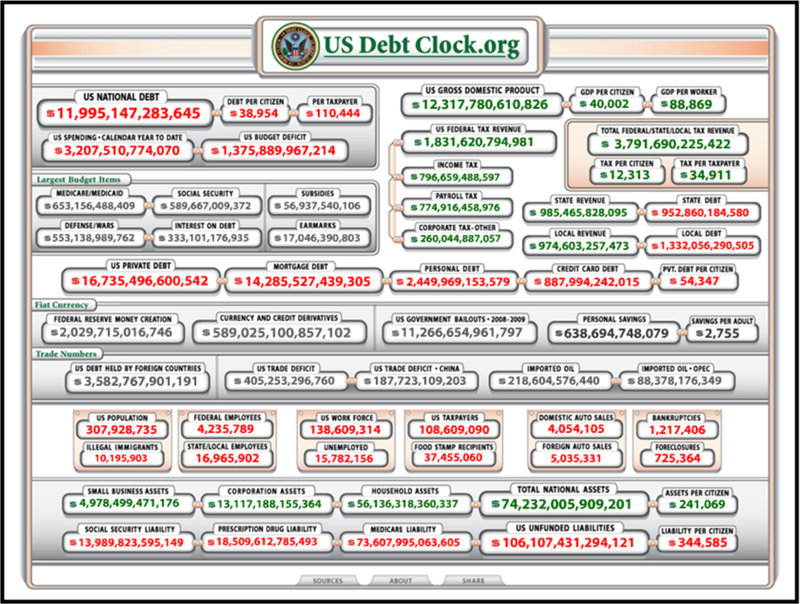 Today’s news, the U.S. debt is now approaching $12 Trillion! Can you imagine having to deal with that… oh yeah, we do have to deal with it! Each and every taxpaying citizen is on the hook for over $110,000 thanks to the mismanagement of our nation’s checkbook. This doesn’t even count our unfunded liabilities like Social Security and Medicare. Every day, thousands of U.S. citizens get fed up with their personal debt and make a commitment to get it under control. Some make the mistake of employing the services of less than honorable debt settlement company, others find salvation by hiring a reputable financial advisor. Many however are determined to take responsibility for themselves and turn their focus on learning how to properly manage their money themselves. There are plenty of resources to turn to including books and blogs. What would happen if our Nations government were to follow the lead of its citizens and turn to the advice of the blogging community? The first thing our government would learn is The Debt Trap Factors That Have Led Us To Our Debt, in this article the Silicon Valley Blogger at WiseBread shared several misconceptions that Obama and Congress could learn from. Next our leaders would need to figure out how to get it all under control. Since they have so far proven themselves irresponsible with the taxpayers money it seems they might be good candidates to listen to Jim at Bargaineering, if they are too busy politicking then maybe they need to Hire a Business Manager to help guide them. Do you think Warren Buffet might be persuaded to take the job? I’ve got to imagine that if Buffett would take the job, his first suggestion would be to get a clear accounting of the true assets and liabilities. It appears there has been enough smoke and mirrors with our nation’s money that nobody really knows where it all is or where it all goes. What they need is a better method to budget. Lynnae at BeingFrugal makes a great case for YNAB Budget Software and is even offering a free copy of the software if Obama would just take a moment to leave a comment on her site. If congress can be convinced to take a real look at their spending habits the will also have to face how much they are spending in interest alone. Patrick at CashMoneyLife can show them how to answer the question, How Much Interest Are You Paying Each Month? Then again, Obama can take a shortcut and sign up for twitter. Recently a Tweet was circulating that said one days interest on the National Debt would cover the college tuition for 123,000 students! Before we educate our youngsters we should probably consider taking care of our past obligations. The Financial Samuarai recently asked Why Are There Homeless Veterans In America? He reported that we have 131,000 forgotten veterans in this country. That just shameful Obama! Our government needs to start first getting things under control, Once the feds do that, they should take steps to prevent from getting in trouble again. Great advice comes from Adam Jusko wrote for GetRichSlowly.org. He recommends How To Establish A Credit History Without Losing Your Shirt. Basically it is a suggestion to get a secured credit card. If the government had to first deposit their money in an account before they spent it, maybe they would cool it a little. When it is time to spend, it would behoove our administration to learn how to spend our money wisely. Our government usually works off a bidding system and jumps for the lowest price. Often this comes back to bite us in the arse. What I suggest they Don’t Buy Low Cost, Buy Best Cost, Craig Ford gives some great tips on how to implement this strategy of How To Find a Good Deal at fivecentnickle. While they are trying to get the most out of what they have, Obama should sign a new executive order to send all government workers on a 5S mission. 5S is standardized method to Get Organized, Save Time, Save Money and Aggravation; it is great for creating more productive environments. I have no doubt (I’ve been in a number of military installations and government buildings) that there are lots of assets that are wasting away. Maybe instead of sending all our money (borrowed from the Chinese!) overseas we could follow the advice of The Mighty Bargain Hunter and simply re-gift a lot of the stuff we have already paid for (or financed). Where Is That Extra French Hen? Do you think it might be in storage next to the $700 toilet seat? Of course a project of 5S-ing our nations publicly owned facilities will take a lot of time, effort and energy. Our public employees could probably benefit with an education on how to get more done with MoneyNing’s 12 Surprisingly Simple Ways to Get More Done. With all that energy they are expending, our nation’s employees are going to have to eat sometime. When I lived in the D.C. area it always amazed me how willing our government workers were to come up with an excuse for a “working lunch” so that they could justify charging off the expense to the taxpayers. Kyle at the Suburban Dollar has found a great deal at Restaurants.com 80% Off. Maybe a new rule Obama can institute is that any government spending requires a coupon. Kyle has also found a couple sites that can easily Digitize Their Coupon Clipping to help Uncle Sam save some cash and make it easy enough for them to do so. There is no doubt in my mind that our government has a lot to learn from the world of finance bloggers. If they would read all these blogs more often it would probably help keep them from making so many mistakes. For example Kevin at Moolanomy shares Why The First Time Homebuyer Credit Is Terrible For The Economy. When are they going to learn that the way to stimulate the economy is not through wealth redistribution? Half of the nations employed are hired by small businesses. If we let the small businessperson keep more of their hard earned money they would be more likely to hire more bodies. But we still have a debt to deal with. Nobody wants to face the reality of how long it’s really going to take to pay our national debt. SingleGuyMoney can help the GAO figure it out though with his post on How Long Will It Take You To Pay Off Your Debt. Isn’t it amazing how much talent and knowledge is just a few keystrokes away? Each of these suggestions for Obama and our nations leaders came from my blogroll on the right side of this screen. Unfortunately I couldn’t quite work all of them in. For example, with the debt load our government has they won’t need the services of the Oblivious Investor anytime soon. But that doesn’t mean you can use his great advice. He highlights some great weekend reading if you are interested. Our governement has a lot of problems to deal with. You have to give Obama credit though, you and I wouldn’t want his job! But all of these issues do illustrate there is a lot of room for improvement. At some point our leaders are going to have to quit their politicing ways and get down to business. They need to find the root causes of our nations problems. Trent at The Simple Dollar did a credible job of describing how to use another Lean Management method called The 5 Why’s And The Power Of Analyzing Your Life. What’s really amazing is that our government doesn’t already apply all this sound advice. It is especially surprising to learn that much of these techniques were ideas that our government took to Japan over 50 years ago. They sent their best and brightest to Japan to help that nation rebuild after WWII. We taught them about quality control and continuous improvement. Lean Management, We Took It To Japan, Is It Time To Take It Back? Unfortunately, if our government began reading the personal finance blogs we would have to be careful of any promises they made to get better. Let’s face it they have not instilled a lot of trust in our nations population. Politicians do have a reputation of saying one thing and then doing another? They should learn to be careful of what they say. Baker at ManVsDebt did, he learned that you have to Eat Your Words if you dont choose your words wisely. If Obama left a comment on my site, I’d have a few things I’d love to tell him. Or maybe I’d just point him to this post, because it pretty much sums up my feelings. My pleasure and thanks for stopping by. Everyone should read your blog, you have a lot of value to offer!